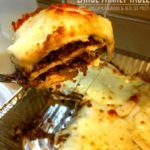 Enjoy this wonderful Burrito Pie Freezer Meal with your large family! One 19 x 11 pan feeds our family of ten once with a few leftovers. It’s a family favorite. Cook 10 lbs of ground beef along with 2-3 diced green pepper, onion, and 1 cup of taco seasoning. I cook my ground beef in a variety of ways (slow cooker, pressure cooker, roaster oven, conventional oven, or two big pans on the stove). Once ground beef is fully cooked, crumbled, and drained add in and mix thoroughly four 16-oz cans of refried beans. End with 6 tortillas topped off with 4 cups of shredded cheese. Use your favorite shredded cheese. In this recipe, I used shredded provolone. To eat right away place pan in preheated oven at 375 with a tented foil lid for 15 minutes. After 15 minutes remove foil lid and allow Burrito Pie to cook an additional 15 minutes or until hot and bubbly. Wrap each pan with a layer of plastic wrap. Set the pan out in the refrigerator the evening before you’d like to serve them.